Hello, first Monday in November! This is the day I promised myself I would start the Christmas knitting I've been putting off since April, when it first occurred to me to get going already. The last few weeks I've been sizing up the people around me for knitworthiness and considering what to focus on this year. It's not too hard - the stores here are packed full of cowls and handwarmers which have suddenly become critical accessories. I even found a pair of fingerless gloves actually attached to fingered 'gloves' that stopped half an inch either side of the fingerless part. I'd rather knit a ton of hats, but they can be fussy to fit, so cowls and handwarmers it is. About 16 of them, in various combinations, because some people rate one of each. GAH. This is what I started with when I went looking for yarn that is not absolutely earmarked for pattern-writing or stuff for me. Not a bad assortment really - there's a pretty good range of styles and weights, and nothing that isn't luxurious in some way. 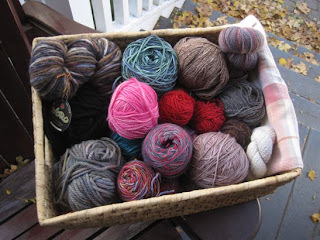 At this point I feel a bit overwhelmed by choice, so instead of thinking What to make for what person, I'm thinking What can I make with What yarn. 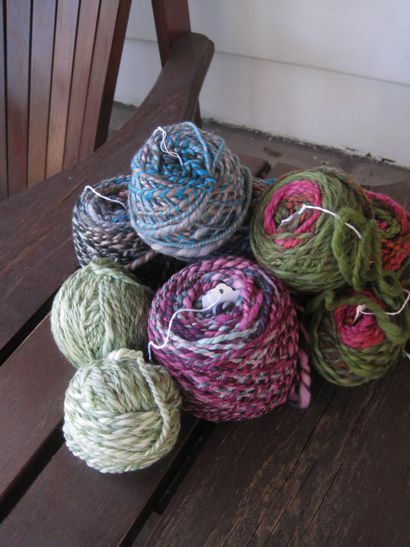 There has been a lot me hunting Ravelry for bulky-weight cowl patterns for example. And a lot of mulling over whether I can get away with using the superbulkiest yarn - top left corner of the yarn basket; it's discontinued Noro - for a hat for me even though I'm supposed to be thinking of others. Unfortunately this approach doesn't seem to be yielding much by way of ideas, apart from the persistent hat one I really need to ignore, or possibly consider a reward for the completion of my first three gifts. I know I want to knit some Eleanor Cowls. For that I need sport weight, which I have - but in limited colour choices I'm not sure are going to be right for anybody but me. And I really want to knit that bulky Noro hat. Dang. Why do I do this? At least there's one safe project: the super fun Flight of the Phoenix set. I can safely knit both hat and handwarmers because I already have those myself and I can use up some nice denimy yarn to do them. Whew. And now if you'll excuse me, I gots some knitting to do.